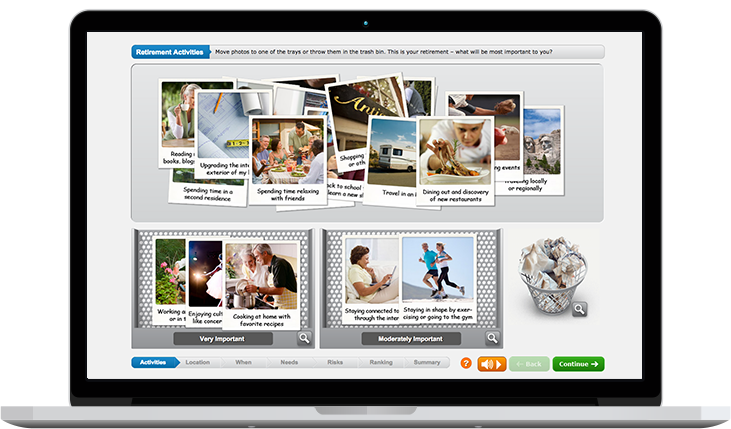 Ready-2-Retire is a web-based, client-interactive prospecting and client retention tool. Say good-bye to "calculator-thinking" and move the client away from numbers and into lifestyle planning. Get to the emotional side of decision-making and connect with people in a whole new way. You can have Ready-2-Retire working for you 24/7 for only $249 (per year). Your Ready-2-Retire subscription will be active for 14 days before your card is charged and you can cancel the payment anytime during your trial period. Prospecting for new clients – the kind you want – can be a difficult and draining process when you encounter considerable prospect resistance, or competition from other advisers. Ready-2-Retire is a new type of tool that allows you to approach prospective clients in a different way – one that demonstrates your interest in their needs, and at the same time allows you to build trust and credibility very quickly. A common reason traditional prospecting techniques fail is that your prospective sources of new business do not yet trust you – they suspect you are more interested in selling products than in solving their problems, and until you are able to convince them otherwise, your prospecting efforts will have mixed results. That is why Ready-2-Retire is such an effective prospecting tool – its focus is on people; their dreams and fears for retirement, and not on products. Developed in conjunction with LIMRA. Radically different from traditional retirement calculators, Ready-2-Retire looks into the ‘emotional’ side of retirement decision making. Get your own unique website address (URL) for your personalised version of the program. Your contact details appear on the home page and any submitted Lifestyle Reports are automatically sent to your email address. Easy to use and highly interactive! Looks and works great on PCs, Macs, and iPads. Keep Your Clients When They Retire! When retired clients switch advisers, they often say it was because their former adviser failed to listen to them, educate them, or lacked the skills they needed. How many clients do you have? How many are over the age of 50 and how important are these clients to your practice? Chances are, your clients over 50 will have accumulated significant assets – they are also likely to have multiple relationships with financial institutions and as a consequence, are the clients most likely to be contacted by another adviser. When retired clients switch advisers, they often say it was because their former adviser failed to listen to them, educate them, or lacked the skills they needed. How would your clients over age 50 grade you in these three areas? In order to “listen well” you need to ask the right questions – especially when it comes to retirement. Do you know the type of lifestyle your clients hope to enjoy when they retire; where they want to live; when they expect to begin retirement; or what concerns keep them up at night? If your answer is “no” or “I’m not sure” Ready-2-Retire offers an easy way to gather this information. By inviting your current clients to complete an interactive online survey, you will gain the insights you need to understand their aspirations, and their fears. This fifteen to twenty minute Ready-2-Retire exercise can be completed periodically, so that as client goals and expectations change, you are kept in the loop, and they know that you are listening – and interested in what is important to them. Ready-2-Retire™ is produced by Impact Technologies Group, Inc. and LIMRA.